For many months the CC web server was unpredictably running out of memory and becoming non responsive or replying with "Too Busy" messages. 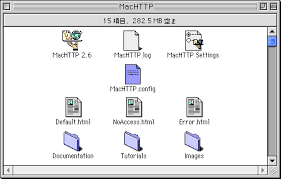 Since MacHTTP is the only application running on the Color Classic this was a puzzler. I reduced system memory demands by removing nonessential control panels and extensions but the problem continued. I finally found the culprit and am posting the solution here in case another user gets into this condition. MacHTTP has an option called PIG_DELAY which allows it to dominate the demand for memory from other applications. At some point I had enabled this option thinking it would benefit the web server response times. By disabling PIG_DELAY the issue was resolved. MacHTTP runs happily now for weeks without any memory issues (previously I was restarting it daily to avoid the problem and keep it online).